Well, this is my last mandatory post for the DIY Food blog. I’ve had a lot of great experiences meeting interesting people, animals and foods. I didn’t realize when I got into this that by choosing to report on slow/sustainable food I was picking one of the most up-and-coming movements in Philadelphia culture. When it comes to generating content and meeting deadlines, that’s as close as you get to a blogging-goldmine. As for the future of this blog, I may continue to post and loosen up the tone a little bit. Or, I may start an entirely different blog and loosen up the content a little bit. Either way, there will be loosening and there will be bloggening. I hope. Posted in Food Philosophizing and tagged beer, Brandon McAllister, foodie comics, Gilda's Biscotti, hazon, salem city community garden. Bookmark the permalink. On the first day of December, I ventured to the East Landis Marketplace in Vineland, where 18 South Jersey food enthusiasts gathered, their arms full of homemade baked goods, canned goods, prepared dishes, crafts and garden treasures. The home-canners, makers and bakers made their way onto the second floor of the Marketplace where they set up their wares, spooning out samples and arranging their offerings. The South Jersey Swappers holiday food swap had begun. The South Jersey Swappers met for a December swap at the East Landis Marketplace in Vineland. Over the past two years, the success of the BK Swappers in Brooklyn has drawn much online attention. As a result, similar organizations (link) have formed in urban areas throughout the country, from Pasadena to Philadelphia, but South Jersey was once again left out of this primarily urban craze. It was only earlier this year that Green Bank resident Lauren Vitagliano started her South Jersey Swappers blog, with the very first swap held in May at Vineland’s Sweet Life Bakery, a stone’s throw from the East Landis Marketplace. Word of the new swapping initiative quickly echoed across the South Jersey blogosphere thanks to local blogs like Jennifer Malme’s Down Home South Jersey (Malme arrived at the December swap with her sweet and spicy pecans and homemade lavender soap) and even media outlets like Edible Jersey Magazine. Galloway resident Abi Douglass brought nine homemade goods to the December swap, including apple cider caramel cookies and romesco sauce. After set-up, participants were free to wander around the designated swapping space, sampling and deciding which items they would be willing to trade for. Participants signed their names on a sheet of paper placed in front of a desired item, also adding which of their items they would be willing to trade. While many of the holiday swap’s participants were first-timers, the events have attracted their share of regulars, or at least repeat-swappers. Seasoned swapper Abi Douglass, from Galloway, brought no less than nine items for the swapping, which ran the gamut from Earl Grey macarons (link) with Biscoff to turkey stock. When the “bidding” process finally drew to a close, the actual swapping commenced. Swap time itself was a bit like the foodie equivalent of a speed-dating event, with participants scoping each other out for trades while countless mason jars and crinkle-wrapped goodies (instead of phone numbers) switched hands. Stefanie Modri’s “loot” includes homemade limoncello, marshmallows, and cinnamon Christmas ornaments. As for me, attending but not participating at a South Jersey Swappers was tortuous! The next time a swap rolls around, I’ll be carrying more than a notebook and a camera. Posted in Events, Foodie-artisans, Intelligent Initiatives and tagged East Landis Marketplace, food swaps, Lauren Vitagliano, romesco sauce, South Jersey Swappers, vineland. Bookmark the permalink. The prospect of teaching yourself to can may seem a little daunting–there’s botulism, bad batches and unfamiliar equipment to worry about. At the Woodbury Fall Arts Festival, I stumbled upon a business that offers the perfect solution for all of South Jersey’s timid wannabe-canners: Jenifer Bernstein’s Yes, I Can workshops. These workshops are the perfect way to jump into canning hands first—from beginner boiling water canning to more advanced techniques. Watch the video to get a sneak peek of what an introductory workshop with Yes, I Can can do for you. Posted in Businesses You Should Like and tagged boiling water canning, canning, carrot cake jam, jenifer bernstein, Woodbury Fall Arts Festival. Bookmark the permalink. Need something with a little more meat to it than candies and fruit cakes this holiday season? Why not let Philadelphia CowShare help your winter menu find the beef? Philly CowShare ensures that all the cuts of meat you see in their logo go to hungry homes. Philly CowShare is the innovative organization that acts as the middleman between you, the consumer, and the farmers and meat processors who produce local, nutritious grass-fed beef. Since part of Philly CowShare’s unique mission is to ensure that all of the beef finds a home, the company sells its beef in bulk, with shares ranging from 1/8 cow (43 pounds of beef) to a full cow (344 pounds). Philly CowShare even offers customers another way to get the most beef for their buck by encouraging group orders (see: a ready-made flyer for those seeking to cow-pool). Of course, with an idea as good as this one, Moore is looking to expand the business into pork territory. Currently working through the research and development of this expansion, she reports that, when compared to cattle-raising, pig raising is (get this) a whole different kind of animal. While Moore perfects her sales pitch for pork, head on over to the Philly CowShare website for more information about the company, who should buy what, and the beef itself. Happy sharing! Posted in Businesses You Should Like, Intelligent Initiatives and tagged beef, cow-pooling, cowshare, grass-fed, jessica moore, philly cowshare, pork. Bookmark the permalink. 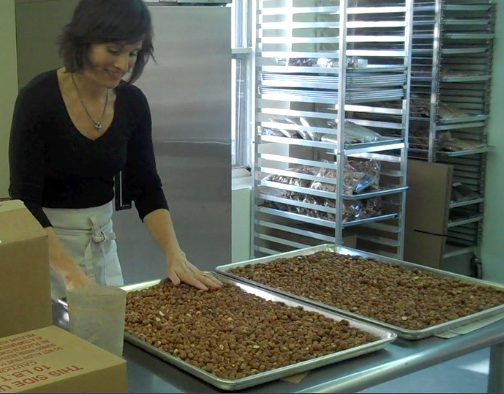 Gilda Doganiero roasting hazelnuts at her Gilda’s Biscotti bakery in Salem, N.J..
As a Culinary Institute of America alum and pastry chef at the Four Seasons Hotel, Gilda Doganiero had no trouble recognizing the plight of American biscotti. All over Philadelphia, Doganiero found that even the most delicious gourmet coffees were being sold alongside an adulterated, Americanized version of the biscotti that she knew and loved. American bakeries were trying to turn this abused little biscuit into a long butter cookie—a far-stretch from its traditional Italian origins. Unable to ignore biscotti’s cries for help any longer, Doganiero left her job at the Four Seasons in 1996 to form Gilda’s Biscotti, a company dedicated to providing Philadelphia-area coffee shops with the real thing. 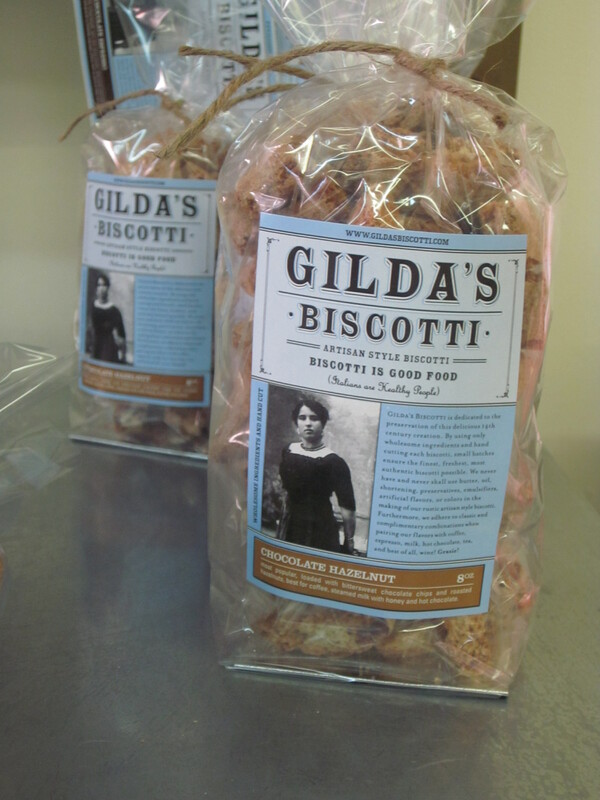 Gracing the label of many flavors of Gilda’s Biscotti is a photo of none other than Doganiero’s paternal grandmother (also named Gilda) freshly arrived in America from Italy. In her Salem bakery—which happens to be about 450 feet from the Salem City Community Garden—Doganiero prepares her biscotti in the traditional Italian style: logs of dough are placed in the oven until almost finished baking and then cut into the classic half-oval shape. Finally, the biscuits are baked again to give them the dry crunch of an authentic biscotti. But for Doganiero, staying true to the recipe starts with ingredients. “I try to keep the flavors that we make very traditional,” she said. Obviously, this means shying away from all those “pumpkin swirl spice” concoctions that fly off the shelves this time of year, but less obvious are the parameters for an acceptable flavor. “Something with a dried fruit or a citrus peel or nuts that would come from that area of the Mediterranean—almonds, pistachios, hazelnuts—[is acceptable],” Doganiero explained. She explains that the traditional flavor that most people associate with biscotti is an almond anise variety that was first made in Prato, Italy. Gilda’s Biscotti can be found in coffee shops throughout Philadelphia and South Jersey (among other places) and are great for crunching, dipping, and trying every flavor! Posted in Businesses You Should Like, Foodie-artisans and tagged bakery, biscotti, coffee house, Gilda Doganiero, Gilda's Biscotti, Pennsville, salem. Bookmark the permalink. Brandon McAllister holding a sample of his experimental habanero pepper-beer. When Brandon McAllister’s hatred of Comcast prompted him to cancel his cable subscription, he did what many bored, local 20-somethings are doing these days—besides subscribing to Netflix. He took up craft beer brewing, a foodie art that has grown to accommodate the Philly area’s beer-snobs as well as its more casual participants. 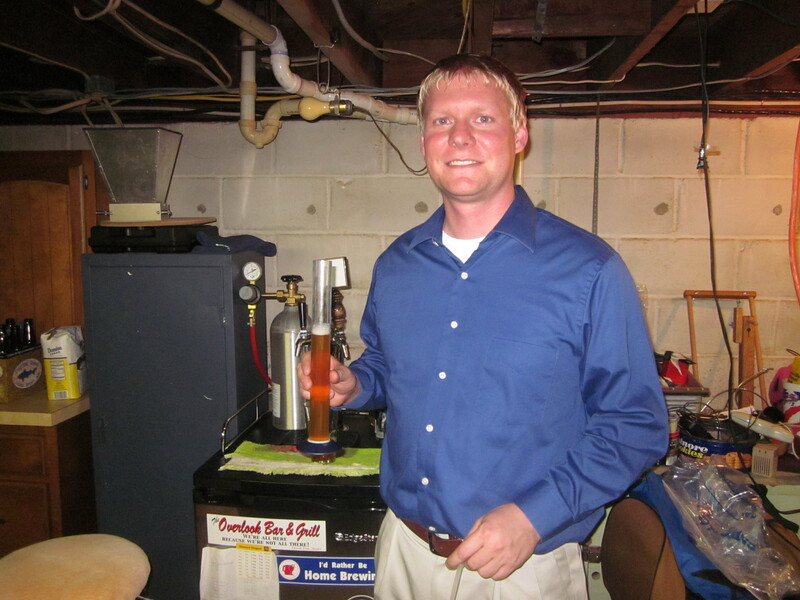 Like many homebrewers, McAllister started out with malt extract brewing before diving into all grain brewing, a less consistent but more customizable brewing method. And Brandon has done pretty well in his brewing endeavors; earlier this year, he and accomplice Ben Foley managed to take 2nd place in Philly Beer Scene‘s first annual Battle of the Homebrew Shops. Posted in Foodie-artisans and tagged Battle of the HomeBrew Shops, beer, Brandon McAllister, brewing, coffee, local, Philly Beer Scene, rye. Bookmark the permalink. The Hazon CSA of Southern New Jersey is dedicated to forging important connections between faith and food. Photo courtesy of the Hazon South Jersey website. The intersection of agriculture and religion is not an unexpected one, just as long as we’re talking about harvest gods, fertility cults and all of those spooky pagan archetypes. Rarely do we conceive of the three Abrahamic religions—Judaism, Christianity, and Islam—as having these same strong ties to nature, but the idea that God has bestowed humanity with land, of all things, is pronounced in all three of these religions’ scriptures. Today, after some 2000 years spent off the land, Jewish communities like Hazon Community-Supported Agriculture of South Jersey are rediscovering the sanctity of the soil. In Community-Supported Agriculture, members buy “shares” of a local farmer’s harvest at the beginning of growing season to be received in weekly allotments throughout harvest time. Hazon (huh-zone), an international Jewish organization dedicated to “creat[ing] healthier and more sustainable communities in the Jewish world and beyond,” has been spreading the CSA model throughout its communities since 2004, raising more than $5 million for sustainable agriculture and donating more than 30,000 pounds of food to food banks. All of this would not be possible without the individual Hazon CSAs sprouting up all over the country, including South Jersey’s very own Hazon CSA. The South Jersey CSA was co-founded by Marty Feigenbaum and Val Yasner in 2004, when the two first paired up with Honey Brook Organic Farm of Pennington and Chesterfield. As Yasner explains, Hazon is an attempt to “connect people to Judaism in ways they haven’t before,” and part of that attempt is rekindling a connection with the land. The Hazon CSA of South Jersey is partnered with Honey Brook Organic Farm. Honey Brook has locations in both Pennington and Chesterfield. Photo courtesy of the Hazon South Jersey website. In its four years of operation, the Hazon CSA of South Jersey has held countless events to raise awareness and build community amongst its members—everything from a yoga and challah-baking event to a Sukkot farm-to-table dinner prepared by famous Philadelphia Chef Michael Solomonov and served to 150 people under a full-sized sukkah, or temporary hut constructed for the Sukkot celebrations. One need not be Jewish–or even religious–to appreciate the impact of the Hazon movement. After all, religious groups have staked out a claim on many social issues, so why should environmental issues be any different? Though Hazon is a Jewish organization, Hazon CSAs are open to people of all faiths. More than 50 Hazon CSAs have been established across the U.S..
Posted in Food & Faith, Intelligent Initiatives and tagged CSA, hazon, Hurricane Sandy, Judaism, Marty Feigenbaum, Michael Solomonov, religion, Val Yasner. Bookmark the permalink.